There are a couple of major construction projects in Redwood City. On El Camino Real, the block between Broadway and Brewster is being updated, as part of the multi-county Grand Boulevard project. This excavator was standing sentry on the Broadway end. 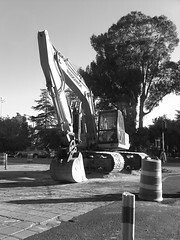 Closer to our house, a new high-pressure water line–part of the Hetch Hetchy system that supplies San Francisco–is being installed, which requires its own host of excavators of all sizes.